Winchester X-pert Upland and Target Steel shotshells combine a proprietary corrosion resistant steel shot manufacturing process with superior Winchester components to create a true break through in high performance. Up to 1400 fps velocity. Consistent patterns. Thicker wad for improved barrel protection. 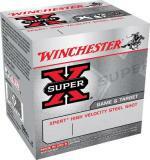 Designed for Upland Game and Target Shooting specifically.